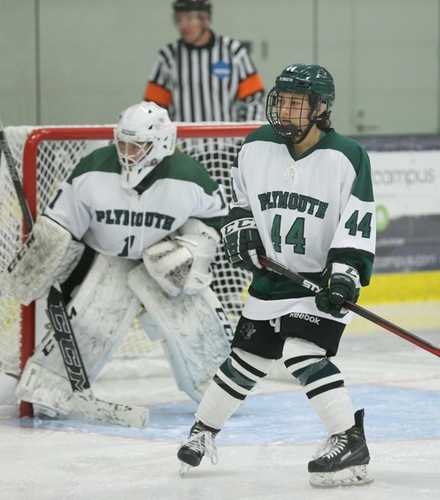 The Plymouth State Women’s Hockey team struggled during their first home game since being back for the Spring 2019 semester. The Panthers were shut out against Johnson & Wales on Sunday the 27th. Johnson & Wales kicked off the action 8 minutes into the match with an unassisted goal that found its way past Senior goalie Emelie Lindqvist (Gulleråsen, Sweden). That would be the only scoring of the night as it would be a stalemate for the rest of the match. The number of opportunities were evenly matched just no one was able to capitalize on them due to the stellar play in goal by both teams. Lindqvist settled in and turned away 25 shots on the night and Jasmine Mucci for Johnson & Wales went perfect turning away all 32 shots she saw. “I think we played a very good and complete game. We had many opportunities throughout the full three periods but just could not capitalize on them. We were more cohesive as a whole and have been working very hard in our past couple games” said sophomore Alex Rajsigl (Tecumseh, Ont. ), “We're hoping to continue to bring that hard work in our next games, with five more conference games which if we do well can put us in a good spot for playoffs… To do so I think we need to bury pucks and capitalize on opportunities given. We're in a very good spot to be able to come back and take the rest of the season. We have some big games coming up that will determine where we place and who will play going into playoffs”. On Wednesday the 30th, the Panthers played host to Amherst during their “Pink the Rink” night at Hanaway Rink. This time the momentum was in favor of the Panthers. Plymouth kicked off the scoring this time by burying 2 goals in the middle of the first period of play. The first coming from senior Brooke Maggy (Los Angeles, Calif.) and the second coming from junior Sydney Linnick (Highlands Ranch, Colo.). Amherst was able to find the net in the 8th minute of the final period but it wasn’t enough as the Panthers cruised to a commanding victory. Lindqvist had an amazing night in goal, recording 52 saves on 53 shots and even contributed on offense when she notched an assist on Maggy’s goal. The Panthers improve to a 4-13-3 record after Wednesday’s match. They are next in action on Friday the 1st when they travel to New England College and then return home the following day, the 2nd, when they play host to UMass Boston. The puck is set to drop at 2pm.